The Southeast Asian nation of Indonesia is certainly a delightful place through and through. Whether you’re treating yourself to its delightful cuisine or visiting the popular island of Bali, it’s an experience you won’t soon forget. If you are traveling to Bali for the first time in particular, you’ll find several customs that are unique to the island, and even different from the rest of Indonesia! The Balinese are polite and friendly people, and respecting their sensibilities will go a long way toward enjoying a wonderful trip to the island that you’ll always remember. 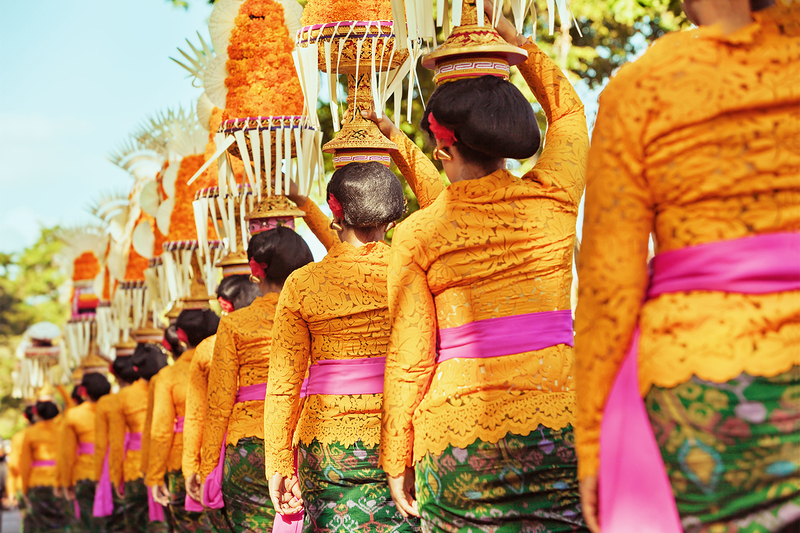 WU has some great suggestions on Balinese etiquette that will help you enjoy your trip to Indonesia to the fullest. The locals in Bali have more conservative customs than most Westerners, and don’t generally approve of public displays of affection, so it’s wise to be as respectful as possible when walking around the island. In general, dress modestly, especially when visiting temples. Women and men should wear shirts that cover their shoulders and upper arms, and are expected to wear a sarong, or scarf, when entering a temple. Don’t have one handy? Luckily the Balinese have this covered, allowing you to rent sarongs and scarves outside of most temples for a small fee. Pictures are generally allowed in temples, however, it’s important to ask first just to make sure you’re not offending anyone or impeding the enjoyment of others. Small donations to the temples for the privilege are generally appreciated. If photography is not allowed, it’s important to be respectful and follow the rule. If you need to point something out, it’s considered polite to call attention to it with the arm extended outward, using the palm rather than the index finger. Likewise if you’re motioning for someone to come near you or join you, make sure to use your palm rather than pointing. In Balinese customs, it’s only considered polite to shake hands with others or beckon with the right hand. One exception is when you use both hands to offer something to someone; this is considered a compliment. Some foods are eaten with hands only, and you’d want to make sure to use your right hand to eat as well. A person’s head is considered sacred in Bali, as the soul is said to reside there. Therefore, touching someone’s head is not recommended, even for friends or small children. It’s common for Balinese to ask what may seem like personal questions to visitors, however, it’s just their way of being friendly and open. Questions like “Where are you headed?” or “Are you married?” are commonplace and are meant to be inquisitive, not imposing. Following these guidelines will definitely make your trip much easier and more fun. Bali is one of the most colorful, beautiful destinations in the world, and you’ll be sure to be greeted with warmth and hospitality wherever you go! Check out more helpful etiquette tips for countries around the world on our WU Blog!